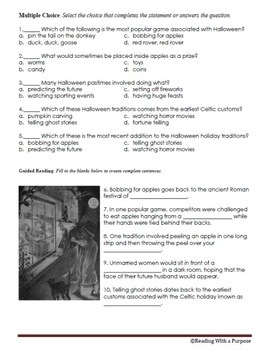 This download is a Common Core adaptation of four of the lessons appearing in Reading Through History's 'History of Halloween' product. 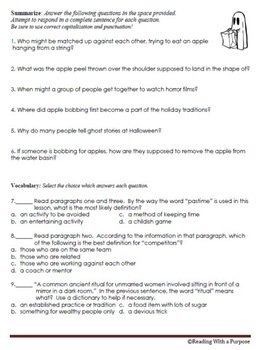 While we are certainly proud of those, we wanted to create questions much more aligned to the Common Core criteria. 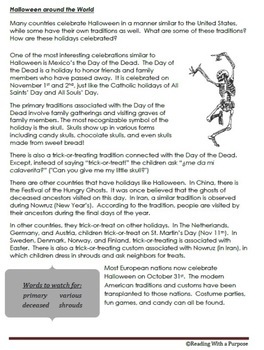 The subjects in this download include trick-or-treating, games, foods, and the celebration of Halloween around the world. For each reading, there are several pages of objectives specifically designed to fit the fourth grade common core. Objectives include Key Ideas, Range of Reading, Key Ideas and Details, Craft and Structure, Range of Reading and Level of Text Complexity, Phonics and Word Recognition, Writing, and Fluency. 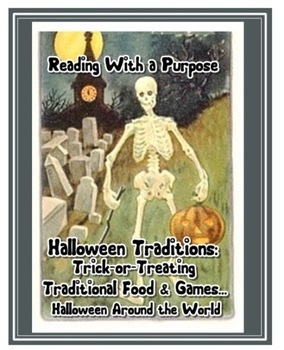 The readings include informative information about the topics as well as the story of how they became an integral part of the Halloween holiday and celebration.